CO2 tubing, a ball lock gas disconnect and a few worm clamps, the perfect CO2 dispensing kit! A standard, reliable CO2 keg connection! 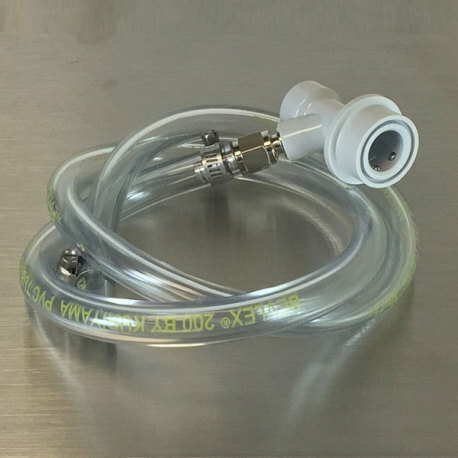 The ball lock gas dispensing kit is a 3-foot length of 5/16" Bevlex tubing with a ball lock gas disconnect and 5/16" swivel nut set worm-clamped on one end, and a small worm clamp on the other that can be used to connect the assembly to a CO2 manifold or regulator. Always good to have around, especially for carbonating several kegs at once! Wow! Great work assembling these. I thought I would have to purchase all the individual parts, put it together and worry if it leaked. But buying this already assembled was the greatest! No Leaks! No Hassle!